The Women of Harper’s Bazaar, 1936–1958 focuses on a pivotal time in the history of Harper’s Bazaar magazine. The exhibition explores the dynamic collaboration among Harper’s Bazaar editor-in-chief Carmel Snow, fashion editor Diana Vreeland, and photographer Louise Dahl-Wolfe, who reinvigorated Harper’s Bazaar by combining their individual talents. Drawing from The Museum at FIT’s extensive collection of Louise Dahl-Wolfe’s color photographs—donated by the photographer herself—the exhibition highlights original photographs shown alongside nine garments by Christian Dior, Charles James, Mainbocher, Claire McCardell, and Carolyn Schnurer that exemplify the vast array of captivating styles featured in Harper’s Bazaar. [L to R] Model Jean Patchett in a Carolyn Schnurer top. Photography by Louise Dahl-Wolfe, color proof, featured in Harper’s Bazaar, December 1952; Carolyn Schnurer, top, 1952. The exhibition opens with an embroidered, elephant-motif top by American designer Carolyn Schnurer. This piece epitomizes the designer’s whimsical sportswear, perfectly suited to an American woman’s lifestyle during the era. 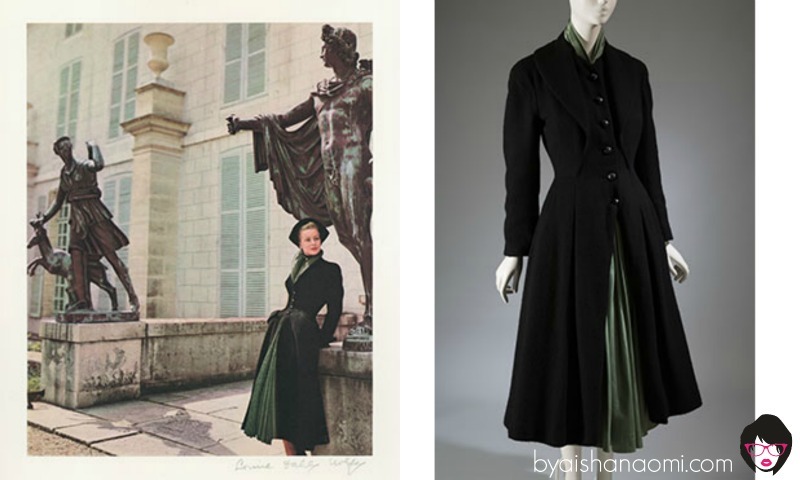 It is paired with a photograph of the same garment in an inverted color scheme that was featured in the December 1952 issue of Harper’s Bazaar. The exhibition continues with sections dedicated to each of the three women, showcasing their individual contributions. Carmel Snow had a forward-thinking attitude and, to quote her niece and successor Nancy White, was a “genius for picking other people of genius.” Diana Vreeland took an imaginative approach to fashion styling, and Louise Dahl-Wolfe explored advancements in color photography and pioneered on-location shooting in destinations such as Egypt and São Paulo. Their talents combined to make Harper’s Bazaar a definitive fashion magazine of the time. [L to R] Model wearing the Mystère coat by Christian Dior in Paris at Malmaison. Photography by Louise Dahl-Wolfe, color proof, featured in Harper’s Bazaar, November 1947; Christian Dior New York, coat, 1954. The impact of the women’s collaborative process is demonstrated through a series of photographs and documents. On display are personal letters between Carmel Snow and model Mary Jane Russell describing a memorable fashion editorial from the Paris collections of 1951. Behind-the-scenes photographs and outtakes document the famous 1942 Arizona desert photo shoot at Frank Lloyd Wright’s Pauson house—styled by Vreeland—during which she stepped in front of the camera after model Bijou Barrington fell ill from heat stroke. [L to R] Model Betty Threat in a Charles James evening dress. Photography by Louise Dahl-Wolfe, color proof, featured in Harper’s Bazaar, April 1947; Charles James, evening dress, circa 1952. Video footage from the documentaries Louise Dahl-Wolfe: Painting with Light and Diana Vreeland: The Eye Has to Travel offer a glimpse into each woman’s personality. Copper-plates and the resulting color proofs reveal the steps of Louise Dahl-Wolfe’s working process. Additionally, four large scale reproductions of Dahl-Wolfe photographs featured in the magazine will be paired with related garments that mimic the fashion seen in the images. [L to R] Model Jean Patchett in Alhambra, Granada Spain wearing a Givenchy ensemble. Photography by Louise Dahl-Wolfe, color proof, featured in Harper’s Bazaar, June 1953; Diana Vreeland modeling at Frank Lloyd Wright’s Pauson house in Arizona. Photography by Louise Dahl-Wolfe, color proof, featured in Harper’s Bazaar, January 1942; Model Bijou Barrington on location in Arizona. Photography by Louise Dahl-Wolfe, color proof, featured in Harper’s Bazaar, January 1942. 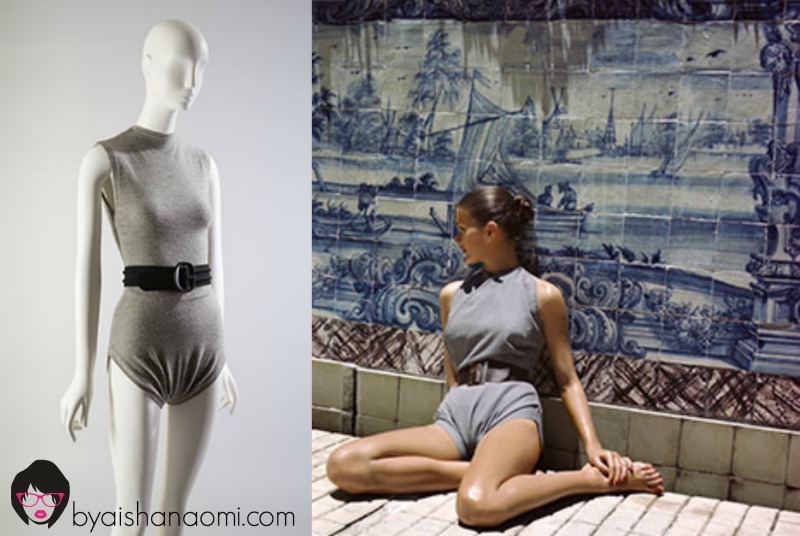 A gray wool jersey swimsuit by Claire McCardell in the designer’s signature style is shown with a photo of a similar design from the May 1946 issue of the magazine. 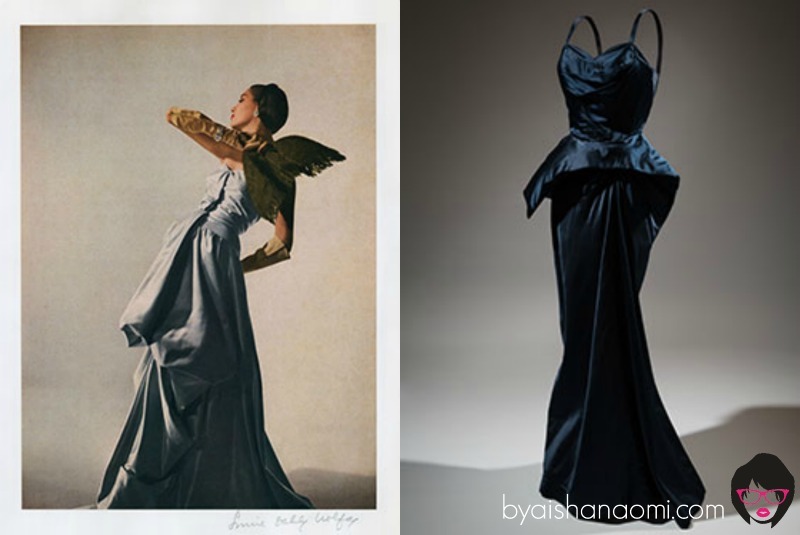 An evening gown by designer Charles James is juxtaposed with a Louise Dahl-Wolfe photograph that mimics the structural silhouettes of American evening wear represented in the magazine. [L to R] Model Betty Bridges in Tijuca, Brazil wearing a Claire McCardell swimsuit. Photography by Louise Dahl- Wolfe, color proof, featured in Harper’s Bazaar, May 1946; Claire McCardell, swimsuit, 1946. The Women of Harper’s Bazaar, 1936-1958 is the first exhibition to focus on the interaction between these three individuals, highlighting collaboration as an essential component of the creative process. With their brilliant colors, arresting compositions, and faraway locales, the Louise Dahl-Wolfe photographs that comprise the heart of the exhibition convey an idea of fashion as a conduit to a more vivid existence.